BETHLEHEM (Ma’an) — The Palestinian Authority and Jordan have agreed to submit a draft resolution to the United Nations Security Council calling for international protection for Palestinian civilians following the killing of an 18-month-old infant by suspected Jewish extremists. ____Palestinian ambassador to Jordan, Atallah Khairi, told Jordanian newspaper al-Ghad that the decision was taken following an arson attack by suspected Jewish settlers which killed Palestinian infant Ali Dawabsha and critically injured his father, mother and four-year-old brother. RELATED – “ZIONIST GROUP . . . ORGANIZED JEWISH GANG . . . which consists of several dozen people, is mainly centered in West Bank outposts but wanders all over Israel, including within the Green Line, and strives to enforce Jewish law. HEBRON ― Israeli forces detained five Palestinians in arrest raids overnight Sunday in the occupied West Bank, Israel’s army and locals said. ____In Beit Ummar, Israeli soldiers detained teenagers Hamza Azmi Ikhlayyil, 18, and Noor Riyad Issa Arar, 19, after smashing the front door to their homes. ____Noor’s father, Riyad, 48, was handed a summons order to appear at Gush Etzion interrogation center for questioning. ____RIYAD IS THE DIRECTOR OF THE HEBRON OFFICE FOR NGO DEFENSE FOR CHILDREN INTERNATIONAL – PALESTINE. 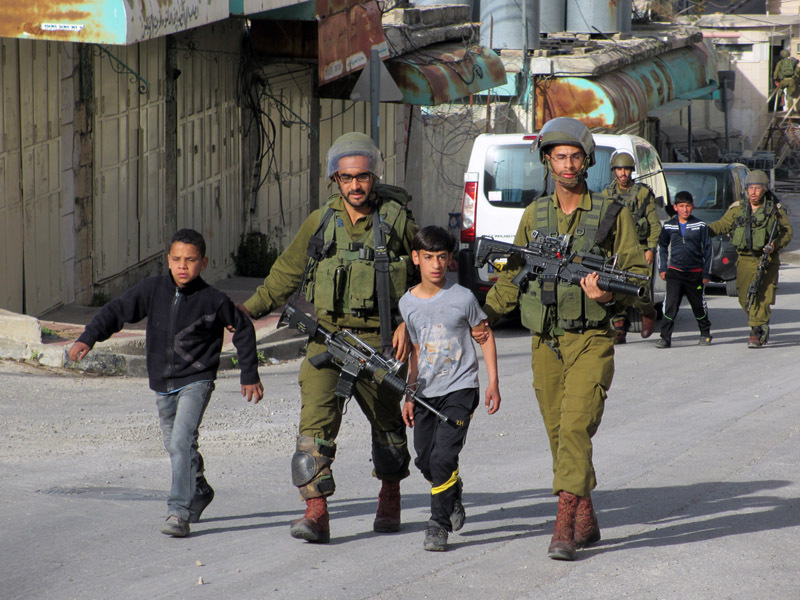 The dangerous terrorists and the children. JENIN ― A wave of violent confrontations broke out at dawn Monday after the Israeli occupation forces (IOF) rolled into Jenin’s southern town of Yabad and attacked the Palestinian unarmed protesters with tear gas canisters. ____Eye-witnesses said over 10 army jeeps raided Yabad, spurring clashes across the town. ____Dozens of olive trees planted in al-Maloul neighborhood were reduced to ashes due to the heavy spates of tear gas randomly discharged by the IOF. 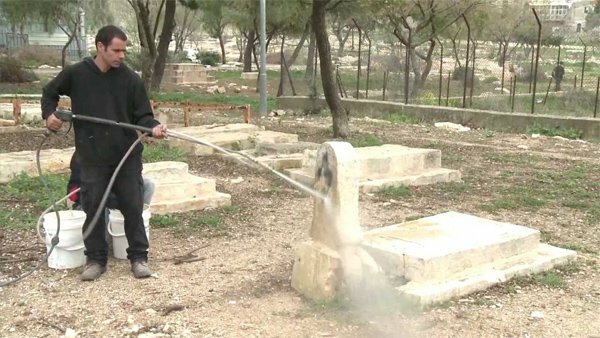 Israeli authorities yesterday opened a new coffee shop and pub build on part of the land belonging to the historical Islamic cemetery of Ma’manillah in the old city of Jerusalem, Quds Press reported. ____In a statement, Al-Aqsa Organisation for Waqf and Heritage said that an Israeli coffee network is running the new facility while the building is managed by the Israeli municipality in Jerusalem. ____The group condemned the “violation” against the cemetery. . .
Overnight on Friday, 31 July, a group of masked Jewish settlers threw firebombs through a window of the Dawabsha family house in Kufr Douma, near Nablus. They fell in the bedroom where the whole family had been sleeping peacefully, setting the house on fire. The arsonists left graffiti, reading “revenge” and “long live the Messiah”, alongside a Star of David . . .
____18-month-old Ali Dawabsha was found a charred body. The rest of the family, Ali’s parents and his four-year-old brother, survived the fire with critical injuries. . .
____This Israeli attack is another crime in the never-ending Nakba the Palestinian people have endured since Zionism’s inception. Ali is another Mohammed Abu Khudeir, who was burnt alive by a group of settlers in Jerusalem on 2 July 2014. He is another Palestinian child falling prey to the Israeli murder machine, as Palestinians commemorate the first anniversary of Israel’s 51-day offensive on Gaza. . . They surrounded Him like a halo. He drank of the cup from which He had abstained. And Sorrow’s bitter taste burned in His mouth. And the others ran away. From: A Lover From Palestine and Other Poems: An Anthology of Palestinian Poetry. Ed. Abdul Wahab Al-Messiri. Washington, DC: Free Palestine Press, 1970. Reblogged this on Abdul karim.